Epithelial ovarian cancer remains as the most deadly gynecological malignancy and it is the seventh leading cause of cancer in women in developed countries. Worldwide more than 200,000 new cases are diagnosed annually, resulting in more than 140,000 deaths. 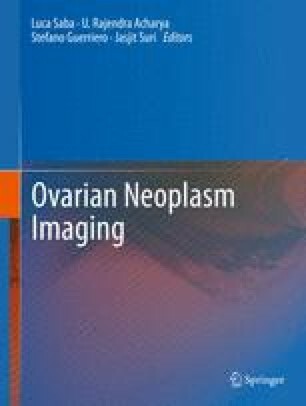 Histologically, ovarian malignancies are classified in two broad groups: epithelial and non-epithelial ovarian cancer. Epithelial ovarian cancers are subclassified based on hystotype, with serous, endometrioid, clear cell, and mucinous carcinomas accounting for 96 % of all cases. In this chapter we shall review the origin, clinical setting, and ultrasound appearance of serous, endometrioid, and mucinous carcinomas.